The time to search for bass offshore is now. Starting in mid-May, a large percentage of the bass population in your favorite fishery will move off the bank to seek refuge on offshore structure. Without high-end electronics, finding these haunts can be an extremely intimidating task, especially if you are inexperienced at offshore fishing. I grew up predominantly fishing Illinois farm ponds and strip mines out of Jon boats. A working depth finder was a luxury we rarely had; high-end electronics like we have available nowadays were unheard of. I’ve since progressed to a 21-foot bass boat circa 2005, but I’ve still never owned sophisticated graphs. Even without the latest and greatest technology, I’ve learned there are ways to locate sweet spots offshore. First of all, this isn’t a knock on high-end electronics. Working in the fishing industry has afforded me the opportunity to spend time in several professional anglers’ boats. Time with the pros has proven to me that utilizing all the technology available in today’s top-of-the-line electronics makes an angler exponentially more efficient at finding offshore structure, and schools of fish themselves. If you want to become an offshore aficionado, invest in top-of-the-line electronics—they’ll make you better, period. But if you’re new to bass fishing or you don’t have the means to run a sophisticated graph, there are still ways to uncover off-the-bank hidey holes. You just have to be willing to put in a little more work and a lot more time. The first step to finding offshore sweet spots is putting in some research off the water. 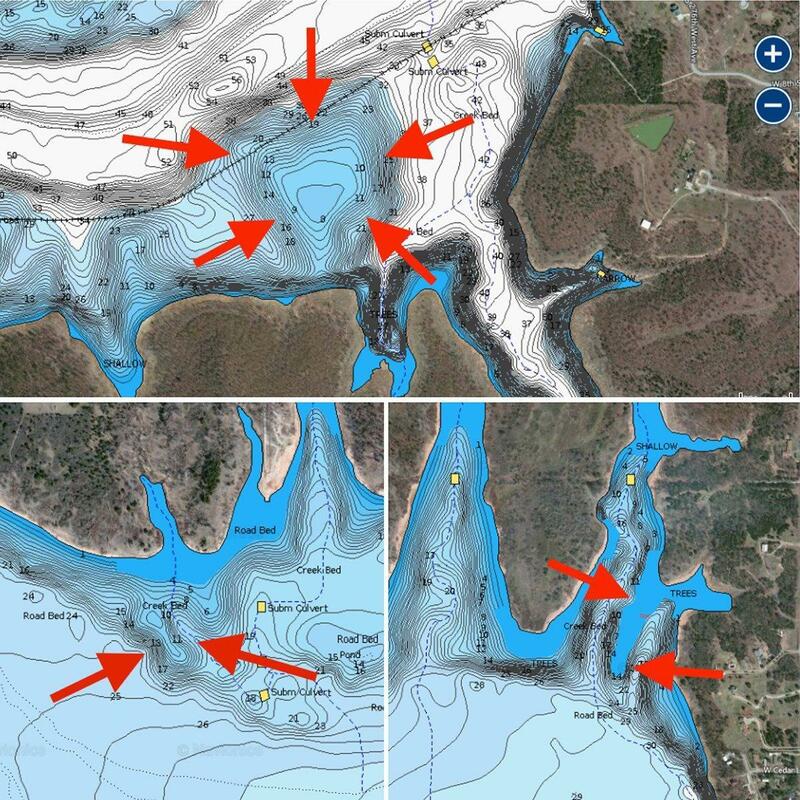 When May rolls around each year, I study as many contour maps or depth charts of a fishery as I can find. Resources like Fishidy, Navionics, Google Earth and old-school paper maps are essential tools when looking for areas off the bank. I find myself predominately using The Navionics WebApp, as you can study a detailed contour map at home on your computer and then pull up the same map on your phone while on the water. What I’m looking for in a map session is likely places bass could be moving to. 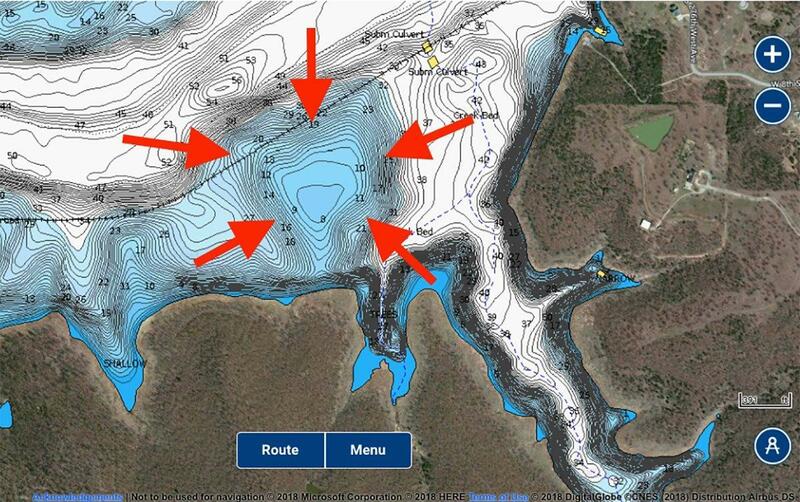 Things like main lake points, creek channel ledges, humps, deep water holes, islands, etc. It’s an imperfect science, but typically I’m looking at long, gradual points or humps that are connected to the shore in the immediate post-spawn phase. As the dog days of summer settle in, that’s when my focus switches to main lake creek ledges, main lake humps or steep main lake points. If you’re familiar with a fishery and have confidence in certain areas of the lake over others, start your offshore search there. Find six to 10 offshore areas you’d like to investigate and go to the lake with those locations in mind. Try to have some variety within those offshore locations, too. What I mean by that is, don’t try to fish six long, gradual sloping points and decide offshore fishing isn’t for you. Instead, fish a few long sloping points, a couple steep points, a hump and a creek channel ledge. By mixing it up, you’ll rule out structure types the bass aren’t keying on, and eventually you’ll find the areas they are using. Recently I’ve been reminded a good offshore spot doesn’t necessarily have to be “deep”. Bass happily set up on off-the-bank structure in three to eight feet of water throughout the summer months as long as they have access to deep water nearby. Current, wind, water clarity and time of day are all key factors when fishing offshore and should be taken into account when looking for key places. 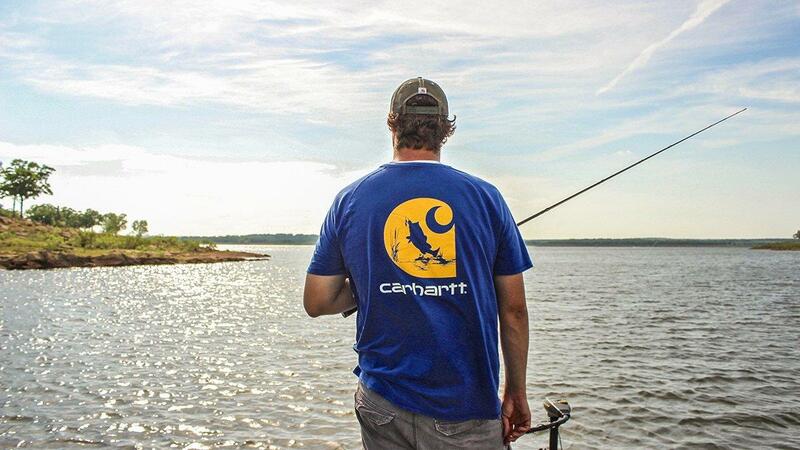 Once you have a handful of promising spots picked out, it’s time to head to the lake. The difference is these fishing trips are more for learning areas than actually catching fish. When I intend to find offshore spots, I’ll only have three rods and presentations on the deck; a deep crankbait like a Strike King 6XD, a 3/4-ounce football jig, and a heavy wobble-head jig like a 11/16-ounce Gene Larew Hardhead. These serve as my tools for learning how the bottom lays out and finding key offshore spots. Go to the areas you’ve picked out and use the deep diving crankbait and heavy-weighted baits to start digging up the bottom. Fan cast the spot, dragging your baits around to try and determine where the shallowest areas are versus where you perceive the edge, or drop off of the spot to be. If you’ve got a simple depth finder, use that to find the drop off. If not, you can get a good gauge on different depth zones using the three lures above. Consider how long it takes your lure to reach the bottom based on different casts and different casting angles. 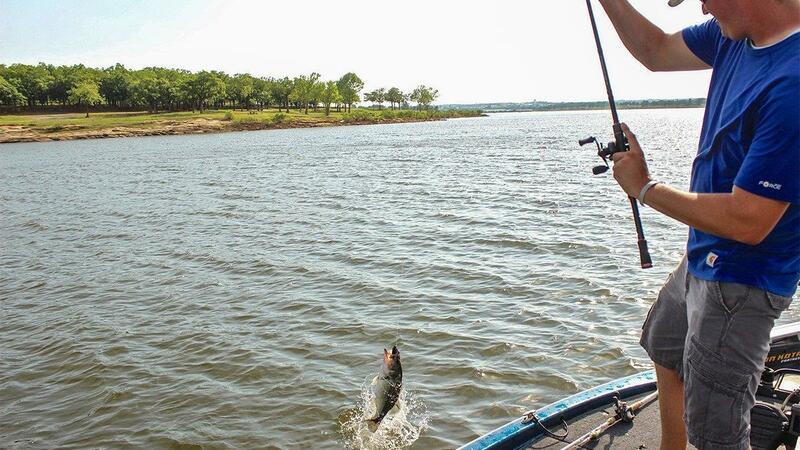 Use a deep-diving crankbait and pay attention to where you are dredging bottom versus where it’s too deep for your lure to make bottom contact. This paints a picture in your mind of how a particular spot or area lays out. Pay close attention as you come across every foot of the bottom and feel for anything different. Feel for brush piles, snags, grass patches, shell bars, weed beds, big rocks, rubble patches, etc. Using lures that maintain bottom contact allows you to determine the bottom composition and locate these key features. It takes practice and a lot of time on the water, but eventually you’ll be able to distinguish between sand, clay, mud, grass and rock. Perhaps the best advice I can give is to have a long memory while learning these offshore locations. As you come through a brush pile, over a boulder or across a shell bar look on the shoreline for an easily remembered landmark and triangulate the spot. Lock this triangulation in your memory bank or write it down in a notebook. You might not fire up a school of bass while you are learning the area, but being able to replicate your casts to the high percentage areas ultimately leads to being more efficient and catching more fish. Using the right fishing line and a sensitive rod for each of these presentations makes deciphering what you feel on the bottom much easier. I purposely throw lighter than usual Seaguar InvisX fluorocarbon line when I’m trying to learn spots. I fish the deep crankbait on 12-pound line, the football jig on 12 to 15-pound line and the heavy wobble-head jig on 15-pound line. The light line helps in two ways. One, the lighter line allows your lure to sink faster and helps you maintain bottom contact with you lure, which is imperative. Also, lighter line is more sensitive. It will more clearly translate what you feel on the bottom, giving you a better understanding of the spot. Similarly, using a fishing rod with enough backbone to make long casts but still has plenty of sensitivity in the tip assists you greatly. Long casts help you cover an area more efficiently while the sensitive tip allows you to truly feel every rock, brush pile or rubble patch you bring the lure through. Finding key areas and catching bass offshore doesn’t have to be intimidating. While it might not be as easy as putting the trolling motor down and fishing the bank, the extra effort you spend finding a prime offshore location is worth it. You’re liable to find a few offshore hidey holes that’ll be home to schools of unpressured bass and become a better angler in the process. Use these tips to help you find a few offshore holes this summer. You may not be able to go out and find 30 schools of bass in one day like an expert using high-end electronics could; but you can find a handful of spots, while learning new offshore areas that’ll ensure you keep your line tight this summer.